A pizza cutter cuts perfect pieces. I love onions! 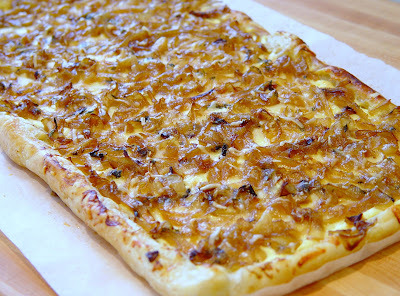 I like them roasted, grilled, breaded, battered, fried, raw, but there is something extra special about caramelized onions. Good enough to eat alone. When onions are slowly cooked, the natural sugars begin to caramelize and bring out a delicious richness that is so savory. Add in a little pastry and creamy base and voila, we have a french onion tart. 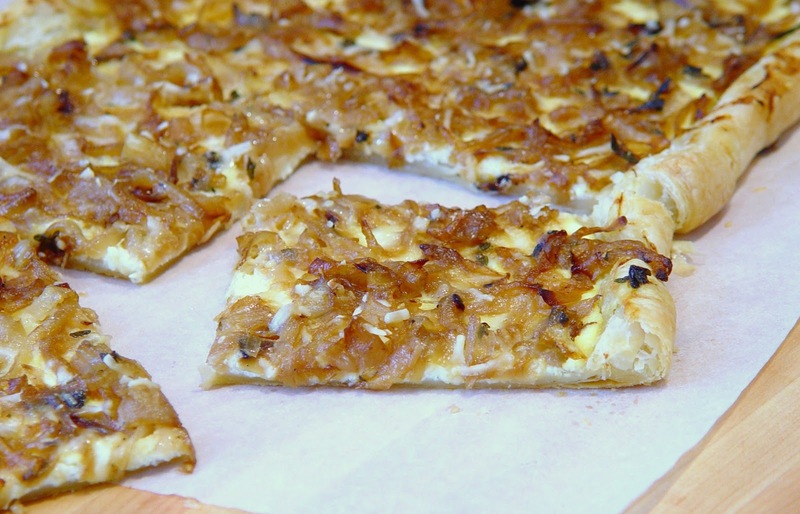 Serve as an appetizer or perfect for lunch with a simple salad. The perfect new addition to my Easter table. Elegant yet so simple! Mix together the ricotta and egg. Fold the edges over about 1/2 - 1 inch. 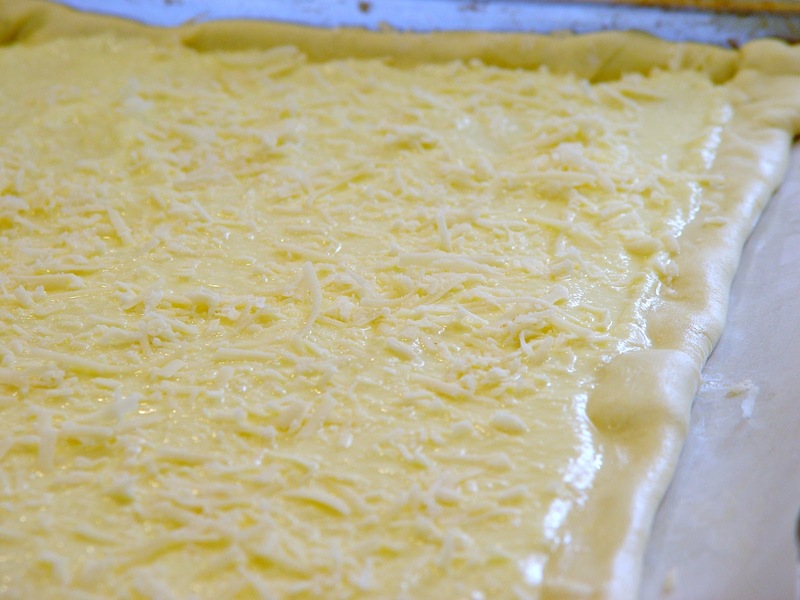 Spread the cheese mixture and sprinkle most of the parmesan cheese on top. 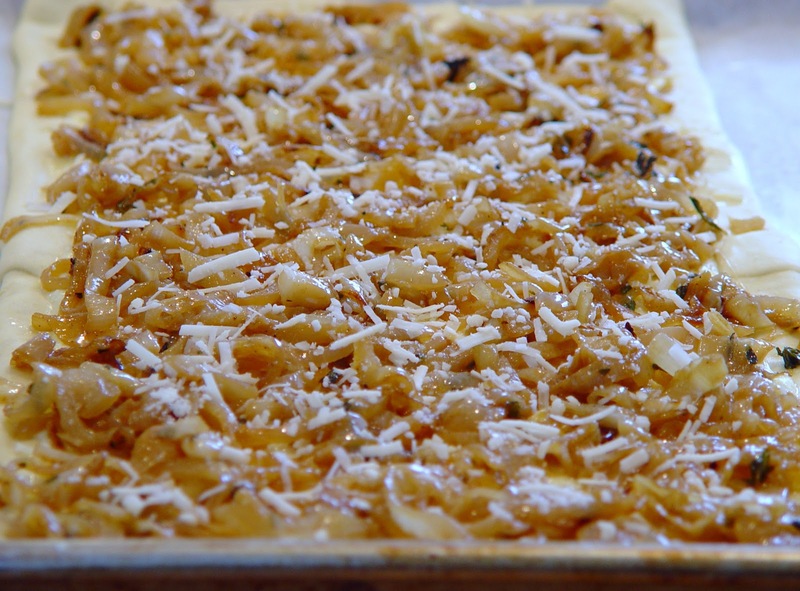 Spread the cooled onions on top and sprinkle the remainder of the Parmesan cheese. Bake for about 30 minutes until the dough is cooked and crispy. In a large sauce pan, melt the butter on medium heat. 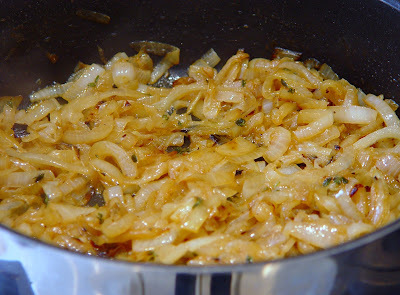 Add the onions, white wine, sugar, thyme, salt and pepper and cook the onions until softened and golden brown. 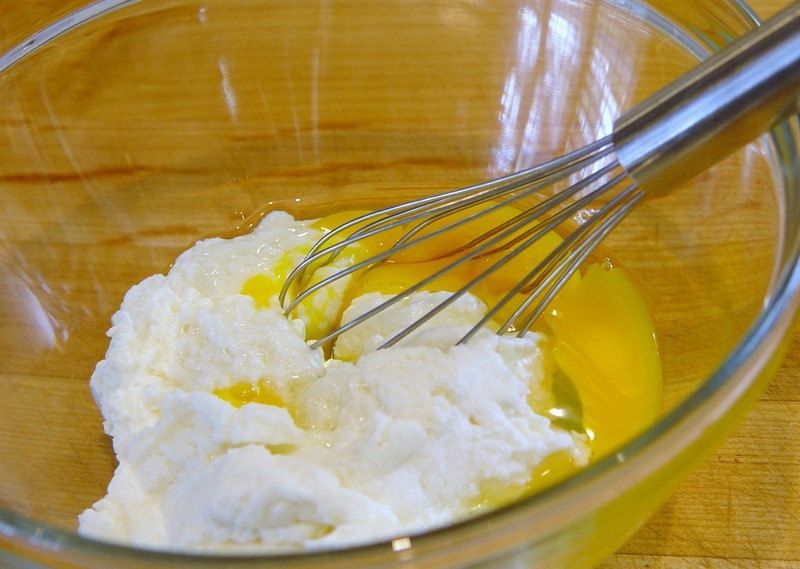 While the onions are caramelizing, combine the Ricotta cheese and egg in a small bowl and set aide. Unfold puff pastry sheets on a a large cookie sheet making sure both sheets connect in the middle of the pan. 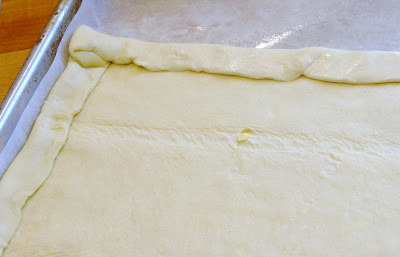 Gently fold in each side of the puff pastry sheets approximately 1 inch. 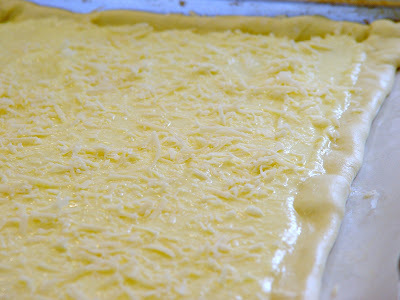 Spread the Ricotta cheese mixture evenly over the puff pastry and lightly sprinkle most of the Parmesan cheese on top. Reserve some to sprinkle on top of the onions. Add the caramelized onions evenly over the cheese mixture and top the tart off by sprinkling any remaining Parmesan cheese. 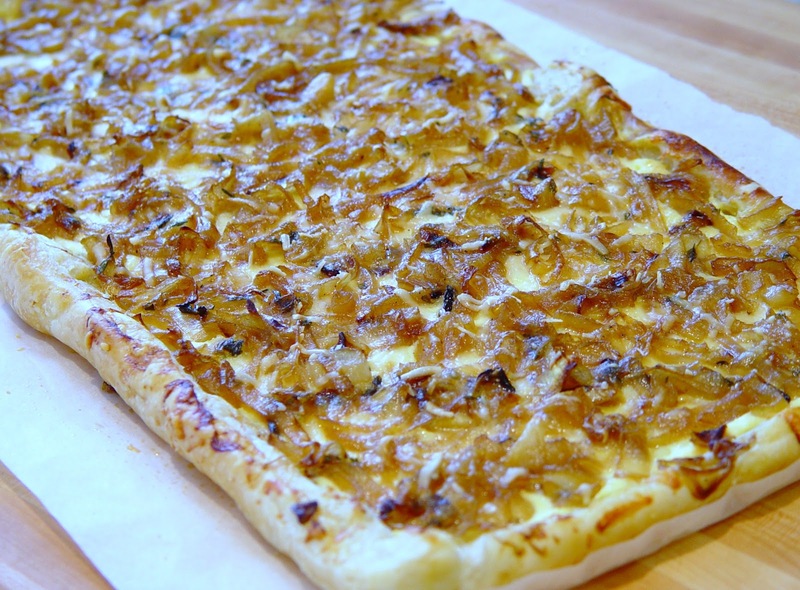 Bake for 30 minutes until puff pastry is golden brown and cooked through. Cut into small pieces for appetizers or bigger pieces to eat as a main dish.